As part of our efforts to support and encourage young Australians in study, careers and volunteering in international agricultural research, our International Agricultural Student Awards from Crawford Fund State Committees will be supporting 14 Australian tertiary students to gain international agricultural research experience and expertise. Successful applicants will participate in international agricultural projects and gain valuable experience in developing countries around the Asia Pacific. Most of the projects they’ll be visiting and working on are related to ACIAR work underway. Organised by the Tasmania, New South Wales, Queensland, Northern Territory, South Australia, and Western Australian State Committees of the Crawford Fund, the Awards were open to students studying a relevant biophysical or socio‐economic aspect of agriculture, animal production, fisheries, forestry, natural resource management or food security. Students will be visiting Vietnam, Honduras, Timor Leste, Tanzania, Cambodia, Solomon Islands, Vanuatu, Fiji, Tonga and Malaysia to engage in local research projects and programs related to their field of study. 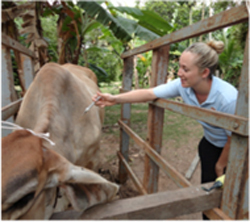 As one of the 14 successful applicants for the New South Wales Crawford Fund International Agriculture Students Awards, Katherine Ashley, PhD Candidate at the University of Sydney recently returned from her trip to Cambodia. As a young agricultural scientist, Katherine worked with ACIAR and in-country partner, The General Directorate of Animal Health and Production to support smallholder livestock production, with a focus on the socioeconomic benefits for smallholder households from improved livestock health and biosecurity. “Livestock form an important part of smallholder systems, providing a source of household income through sale of animals, providing manure and draught power for crop production and acting as a store of wealth,” Katherine said. “However, smallholder production continues to be constrained by inadequate nutrition due to reliance on traditional feed sources and diseases such as Foot-and-Mouth Disease (FMD) and Haemorrhagic Septicaemia (HS)”. 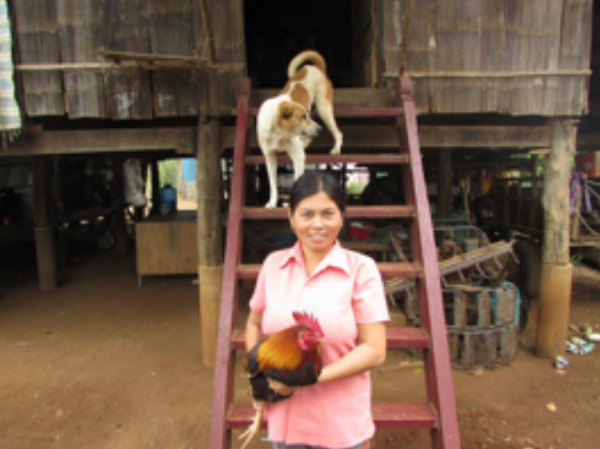 Katherine was exposed to the work being done to improve farmer livelihoods through more efficient livestock production under ACIAR’s ‘Village-based Biosecurity for Livestock Disease Risk Management in Cambodia’ project. Previous research had demonstrated the benefits to farmers from feeding forages and vaccinations so the aim was to build on those findings and investigate benefits for all livestock species including cattle, buffalo, pigs and poultry. However, further work is required to assess the impact of animal nutrition and biosecurity interventions to project households as they transition from livestock keepers to livestock producers. “With the support of the NSW Crawford Fund International Student Award, a survey will be carried out in Cambodia to evaluate the socioeconomic benefits of improved livestock health and biosecurity for smallholder households. This survey will enable us to determine the benefits to project households from improved livestock practices and highlight further areas for training and support. It will also include greater focus on the role of women in smallholder farming systems”. Back in Australia, Katherine says, “I would like to acknowledge the NSW Crawford Fund Committee for their generous support which has provided funds to travel in-country, conduct this research and develop my skills as a young agricultural scientist”. Joanna Talbot and Olivia Woodiwiss from the University of Tasmania – they’ll be heading to Vietnam in October 2017 and focusing on the intensification of beef cattle production in upland cropping systems in North West Vietnam.